Though I am very fond of most of Clark Ashton Smith's tales of the far future continent Zothique, I am particularly fond these days of his "The Dark Eidolon." 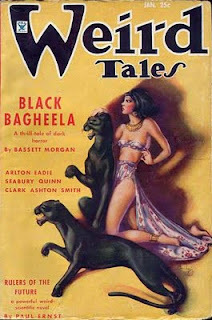 First published in the January 1935 issue of Weird Tales, "The Dark Eidolon" is also Smith's longest Zothique story. That length is, in my opinion, also its greatest weakness, for while there's no question that the text of the story contains some of the most powerful and evocative images in the CAS canon, it nevertheless feels self-indulgent, as if Smith has thrown his literary sense to the wind in order to revel in pure esthetics. Now, if you enjoy lush, luxuriant prose, you might not even consider this a defect in the story and, on some level, it isn't, especially if you read Smith for his imagery rather than his plotting. However, not everyone has the same degree of patience for this and, if so, they may find "The Dark Eidolon" rough going in places. The story tells the tale of the fate of the sorcerer Namirrha of Ummaos, "who imposed his black yoke on the cities of Xylac and, later, in a proud delirium, deemed himself veritable peer of Thasaidon, lord of Evil." Thasaidon, as his name suggests, in Zothique's equivalent of the Devil and is the literary ancestor of Greyhawk's deity Tharizdun by way of Rob Kuntz's own Tharzduun. He's also the inspiration for Typhon in my Dwimmermount campaign and the name of his high priest in Adamas, Saidon, is an explicit connection between the two deities. Namirrha was not always a great and powerful magician. Indeed, none could have dreamt that the great sorcerer was one with the beggar-boy, Narthos, an orphan of questionable parentage, who had begged his daily bread in the streets and bazaars of Ummaos. Wretchedly had he lived, alone and despised; and a hatred of the cruel, opulent city grew in his heart like a smothered flame that feeds in secret, biding the time when it shall become a conflagration consuming all things. Narthos had been abused by Prince Zotulla, who refused him alms and trampled him beneath his horse "nigh to death." Zotulla grew to manhood and became emperor of Ummaos, while Narthos became a mighty necromancer and seethed with a desire for revenge. It is this desire that forms the basis for the story, with Namirrha consulting a "dark, gigantic statue of Thasaidon" -- the dark eidolon of the title -- for advice on how best to avenge himself upon Zotulla. Strangely, Thasaidon, speaking through the statue, rebukes Namirrha for his request for assistance. "I have helped you heretofore in all things," said the image, with stony and sonorous accents that were echoed metallically in the seven silver lamps. "Yea, the undying worms of fire and darkness have come forth like an army at your summons, and the wings of nether genii have risen to occlude the sun when you called them. But, verily, I will not aid you in this vengeance you have planned: for the emperor Zotulla has done me no wrong and has served me well though unwittingly; and the people of Xylac, by reason of their turpitudes, are not the least of my terrestial worshippers. Therefore, Namirrha, it were well for you to live in peace with Zotulla, and well to forget this olden wrong that was done to the beggar-boy Narthos. For the ways of destiny are strange, and the workings of its laws sometimes hidden; and truly, if the hooves of Zotulla's palfrey had not spurned you and trodden you under, your life had been otherwise, and the name and renown of Namirrha had still slept in oblivion as a dream undreamed. Yea, you would tarry still as a beggar in Ummaos, content with a beggar's guerdon, and would never have fared forth to become the pupil of the wise and learned Ouphaloc; and I, Thasaidon, would have lost the lordliest of all necromancers who have accepted my service and my bond. Think well, Namirrha, and ponder these matters: for both of us, it would seem, are indebted to Zotulla in all gratitude for the trampling he gave you." "Yea, there is a debt," Namirrha growled implacably. "And truly I will pay the debt tomorrow, even as I have planned.... There are Those who will aid me, Those who will answer my summoning in your despite." "It is an ill thing to affront me," said the image, after an interval. "And also, it is not wise to call upon Those that you designate. However, I perceive clearly that such is your intent. You are proud and stubborn and revengeful. Do then, as you will, but blame me not for the outcome." Even those not familiar with Smith will recognize that Namirrha's unrelenting desire for vengeance will bring him to a bad end and it is this course of events that the remainder of the story chronicles. "The Dark Eidolon" is thus a fairly typical Clark Ashton Smith story but I personally find it much more compelling than others of its kind. In part, I think it's because Thasaidon, who's described as an "archfiend" and "lord of the seven Hells" and other such diabolical things, comes across as a much more rational, even ethical being than does Namirrha, who has allowed an ancient slight, one that in fact laid the groundwork for his eventual greatness, to consume him to the point of self-destruction. The story rings oddly true to me and more than makes up for its literary shortcomings in other areas. While I've somewhat lost my taste for the prose style of Smith and even Lovecraft ("florid" is the word that most often comes to mind), I recently read this story and liked it quite a bit. There was a quality of justice to it, as everyone (IIRC) got what they deserved, but also a sense of creepy inevitability. Aswith all the Zohique stories ,there's always some great visual depravity happening within in the tale. The " party" scene being one of them.